This bit of news will no doubt be a big badge of honor for the few owners there are out there of the Volkswagen Touareg V10 TDI. 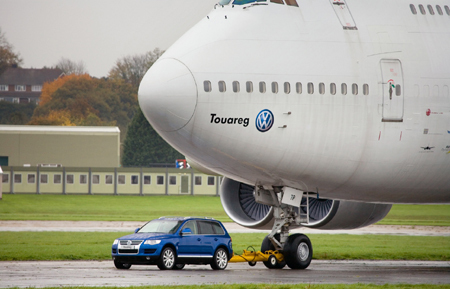 VW is hoping the number of Touareg TDI owners will grow, and demonstrated the diesel ute's mighty pulling power recently in a press event that pitted it against the standing weight of a Boeing 747. The Touareg was "lightly modified" with the addition of 7,030 kg (15,498 lbs.) of ballast weight (!) and the fitment of the 4.56 axle from Touareg V8 model. The latter mod turned out to be unnecessary since the driver, Uew Krieghoff, performed the stunt in the low ratio, second gear. Other than that, the Touareg was also fitted with a special tow adapter to marry the two vehicles together and wore outer body panels that made it look the same as the next gen Touareg being launched early next year. The engine, transmission, suspension, tires and brakes were all stock. 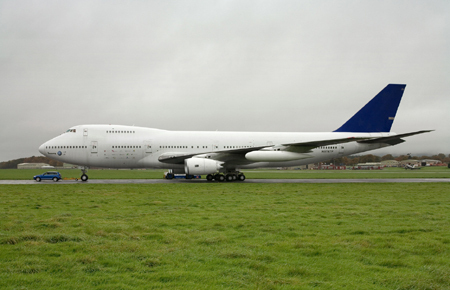 The plane used for the stunt was a decommissioned Boeing 747-200 that weighs 155 tons. 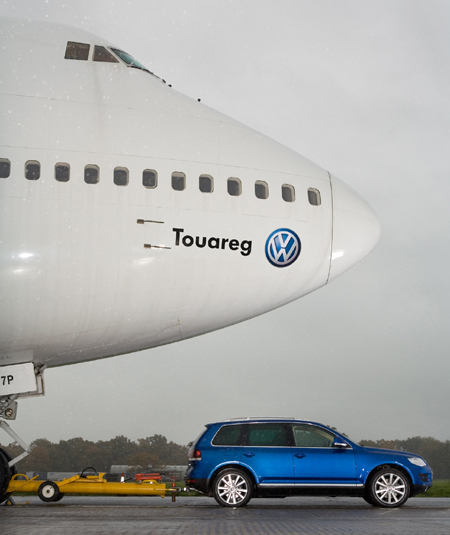 VW had initially calculated the Touareg could successfully pull 200 tons, and had even done a dry run with a 190-ton Boeing 747-400. Unfortunately, the only plane that could be acquired for the PR stunt was this one that is usually used as a giant prop in films. Apparently it didn't put up much of a fight, as the Touareg towed the jet 150 meters at 5 mph before slowing itself and the plane to a stop with its stock brakes. Impressive indeed, and we think the Touareg V10 TDI has laid down the gauntlet for our domestic heavy haulers. Let's see what crazy objects the Ford Super-Duty, Chevy Silverado HD and Dodge Ram 3500 can tug around. Follow the jump for more pics of the Touareg's towing exploits.